Glam rock icons KISS are back and their shows promise to be wilder and more explosive than ever. Expect plenty of pyro, facepaint, flames, flying zip wires, fire breathing, blood and fireworks. As a tribute to the rock titans, we thought it only right we pick out five times they gave rock ‘n’ roll to you. KISS are notorious for their stage antics and Gene Simmons was the worst for getting down and dirty back in the day. The statuesque bassist would often gorge on fake blood and breathe fire. Over the course of their career Simmons is believed to have set himself ablaze over half a dozen times – and he was captured on camera accidentally setting his hair alight in this clip. It became so common, he often had a roadie on hand to snuff the flames out with a blanket. ​​​Watch our product feature video for a Rare Kiss Comic Book Magazine, Issue #1 from 1977! Visit us online ▶ http://www.luckypennyshop.com ▶▶ Follow Us ◀◀ TWITTER http://twitter.com/luckypennyshop FACEBOOK http://www.facebook.com/LuckyPennyShop INSTAGRAM http://instagram.com/LuckyPennyShop GOOGLE+ https://plus.google.com/+luckypennyshop PINTEREST http://www.pinterest.com/luckypennyshop/ LPS WEBSITE http://www.luckypennyshop.com/ ▶▶ About Us ◀◀ Lucky Penny Shop is a family-friendly YouTube channel that features videos of kids food maker sets, new & vintage toys and candy from around the world! With their Joker-style make-up and silver space costumes, KISS took on the personae of comic book-style characters from the outset. Paul Stanley became known as The Starchild , Simmons, The Demon, former axeman Ace Frehley was donned The Spaceman or Space Ace while original drummer Peter Criss was named The Catman. So it was no surprise in 1977 when they made their comic debut in issue 12 of Howard The Duck. Marvel Comics continued to recruit their services alongside the likes of Captain America, Iron Man, Spiderman etc for many issues to come. Apparently, blood from each band member was also drawn by a registered nurse, witnessed by a notary public, and poured into the vats of red ink used for printing at Marvel’s Borden Ink plant in New York – meaning your copy of their Marvel Comics Super Special came with extra DNA. Sensing it was time for a change, KISS made a ballsy move and ditched their trademark makeup and costumes in 1983. The band officially appeared in public without makeup for the first time on an appearance on MTV on September 18 that year, which coincided with the release of the band’s new album, ‘Lick It Up’. They cleaned up in the process with the album going gold and its 1984 follow up ‘Animalize’ going on to become KISS’ best-selling LP in America over the decade, with over 2 million sales. It doesn’t get any more rock ‘n’ roll than KISS’ merchandise. If you check out their website you can snap up a KISS pinball machine, Ugg boots and dog bandanas. 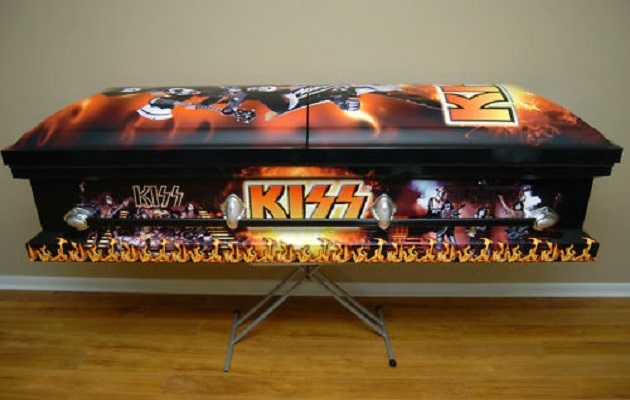 But they went completely out there in 2001 when they unleashed the ‘KISS Kasket’, the band’s very own funeral casket complete with the band’s logo. Unveiling the casket Simmons declared: “I love livin’, but this makes the alternative look pretty damn good.” When former Pantera man Dimebag Darrell was tragically shot dead onstage in 2004, he was buried in a ‘KISS Kasket’. It doesn’t get any more rock ‘n’ roll than that. In 2008, Simmons designed his own axe guitar controller for Guitar Hero II and Rock Band, which was scrawled with his autograph and a photo of him painted across the body of the controller. Then he stepped up to the plate and shredded his bass guitar out at the Guitar Hero championships in New York. Did he manage to make it look cool? You decide.